I first came across Ethical Infant on my Instagram feed several months ago. I loved the simple yet beautiful hand-drawn designs, and the fact that all the items are made from organic cotton, are fair trade, made in the USA and use minimal packaging for shipping. 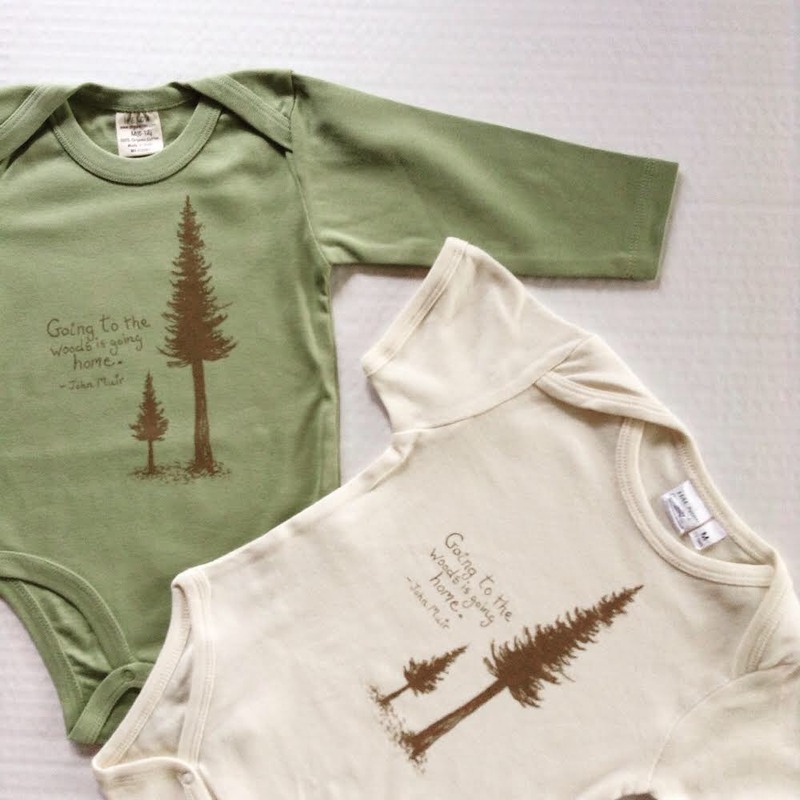 I purchased this onsie for Wren as it seemed perfect for our new life/home in the forest and I love it. I have a passion for supporting momtrepreneurs, especially those that are working hard to protect the environment. I recently asked the founder, Katy, to share a little about her inspiration and passions so we could learn more about this great brand. Me: Please could you share with us your inspiration for starting Ethical Infant? Katy: Initially, Ethical Infant was born out of a desire to change the messaging in baby clothing. I'm sure that you've seen it - you walk into a store, and instantly you are assaulted by the cliché, unfortunate, and often offensive messages plastered all over the baby clothes. Of course, the boy’s clothes are all blue, and the girls are all pink, and they say "Little tough guy", "Bad to the bone", or "Future All-star" for the boy selections. The girls’ clothing reads "Too cute to follow the rules", "Diva in training", or "Born to Shop" - really? Eek. It is truly interesting how much a child's clothing (especially when they are of a non-verbal age), influences the interactions that they have with those around them. As a mom, I am determined to change the conversations that people are having with my kids. Clothing so often, and so unfortunately perpetuates heteronormative and hyper-sexualized messages, along with promoting ableism, and materialism. What about kindness? What if my kids don't fit into societal expectations? What if, oh no, they have a disability, that makes being a "future All-star" impossible (please insert sarcasm here). No more "Oh, you're so pretty. Are you a little diva?" or "hey little tough guy, you're such a bruiser". Our kids deserve better. What are the important ways your product is making an ethical and environmental difference/ the ways it gives back? After we decided to create a line of garments, we knew that it was important to create a beautiful product from beginning to end. As we began to look into garment purchasing we were struck by the rampant exploitation (of both the environment and workers), that takes place at every level of textile/clothing production. After a great deal of searching, we were fortunate enough to partner up with the HAE NOW company. They offer 100% organic cotton clothing blanks that are Fair Trade certified. All of their farmers and factory workers are paid a living wage (which is about 37% higher than the wages paid in a non-fair trade company), have health care stipends, have access to educational opportunities for themselves and their children, receive meal vouchers, have transportation share options, and have returned to safe and sustainable production practices (I could go on about this company all day - they rock). The farmers that they work with have created a "farmers bank", where portions of shared profits are used in the local communities to create well systems, and improve sanitation. Hae Now also encourages unionizing. Far from the norm in the garment industry, all female factory workers in this company can join a union (typically, only men can join unions). Their farms and manufacturing are in India. In our social media interactions, we understand that we must play a larger role in the sustainable fashion community. Let’s face it, a land fill full of organic cotton, is still a full land fill. On our Instagram and Facebook pages, we have links to organic garment care, and share videos on how to up-cycle children's clothes, repairing tears, and how to convert winter items into summer items. One of our primary goals is to be part of a movement that makes Ethical Fashion mainstream, for EVERYONE - babies, hipsters, grandmas - you name it. Additionally, we aim to be ZERO waste on our end. We recycle all shipping and manufacturing containers that we encounter. We use an eco-friendly, low-impact dye for our designs, and we wrap our items in recycled tissue and organic twine for shipping. Could you share which is your fav product (and why) from your collection? I love the image of the lion peacefully laying with the lamb, and the words speak to my heart. Katy, thx so much! Let’s all vote to save the planet with the power of our purchases, lets choose brands/small businesses that are striving for the best environmental practices.